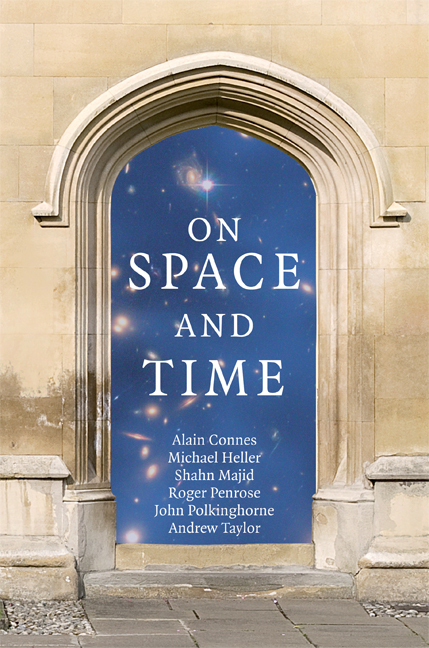 Continuing his series of posts on space and time, Shahn Majid examines some of coauthor Roger Penrose’s revolutionary ideas. Could we, today, see remnants of a previous universe? Past lives and life after death are paltry matters compared to Roger Penrose’s latest ideas about the origin and fate of the Universe itself. In his chapter of the multi-authored volume On Space and Time, Penrose argues that certain types of information could be carried over from a previous Universe through the ‘big bang’ into the present Universe, and likewise information could proceed to the infinite cold dark future of our Universe to be carried over into the next. This is bold stuff and in this week’s post I’d like to give some idea of what is involved. Roger would be able to do it far better himself of course. The first ingredient is one that many popular science readers will be familiar with — the idea of time dilation. You may know that if you travel in a train at high velocity then you actually experience time more slowly relative to a person on the ground. This is not too noticeable on the Eurostar train, as you have to be close to the speed of light for the effect to be significant (I make it about 0.2 nanoseconds less time experienced on the trip London to Paris). But, as Penrose observes, for a photon of light itself, time is so stretched that it experiences no time at all! So it is that a photon could traverse the 10 billion year history of the Universe and quite easily carry information to its infinite future and, according to Penrose, beyond it. Next, many readers will also know that these days gravity is expressed as the curvature of spacetime. The usual way to visualise this is to think of an ant moving about on a two-dimensional surface, which could be bent this way or that. Some of what you see is an artefact of the visualisation but some of it is intrinsic to the surface and determines such things as the shortest path between two points and the length of that path. It’s an analogy for our 4-dimensional spacetime where we don’t have the luxury of being able to `step outside it’ as we do when we look down on the ant. Now, suppose spacetime were to be stretched or distorted in such a way that relative angles and shapes were preserved, even if distances were not. The thing that Penrose observes is that light and other massless particles are necessarily insensitive to such ‘conformal rescalings’. If the world was only made up of such things, there would be no way to detect such a rescaling! Well, conformal rescalings can be used to `scale back’ the infinite future of the Universe so that it appears as a finite boundary. As Penrose likes to point out, this was anticipated in some of the works of M.C. 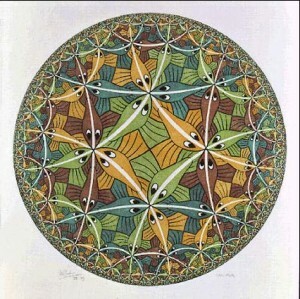 Escher, notably in his ‘Circle limit’ series. See how the shapes are retained as an entire infinite (hyperbolic) plane of them is squashed into a finite circle. Likewise, one can use conformal rescaling to `blow up’ the point in time which is the putative `big-bang’ creation of the Universe into a finite boundary. So far these are just mathematical tools. But Penrose can now put forward his hypothesis that the boundary in the far future can be identified with the boundary at the big bang of a subsequent Universe and that the boundary at the big-bang of our Universe can be identified with the far future of a previous one! ‘Identified’ here means up to conformal rescalings, i.e. it means in so far as observable by massless wave-particles such as photons and gravitational radiation. Even more, the information carried by such fields could propagate right through the boundary from one Universe to the next, making this theory in principle testable. I am oversimplifying quite a bit here — the identification at the boundary takes the form of a certain `Weyl curvature hypothesis’ which Penrose proposes (and which in its current form builds on the work of his Oxford colleague Paul Tod). Anyhow, such things as colliding black holes the size of galaxies and galactic clusters, in the far future of the previous Universe to ours, would produce huge amounts of gravitational waves which would connect through into our Universe as a particular pattern of inhomogeneities that we might be able to detect. There are a lot of immediate questions raised by such a bold proposal and Penrose addresses them carefully and in depth. Probably the most fundamental is how could entropy always increase if Universes are repeating in this way? Penrose argues that one must take into account the entropy of gravity or of spacetime itself, so to speak, as expressed in part of its curvature. Although Penrose’s treatment does not yet include quantum gravity effects at the big bang and although the experimental predictions have yet to be developed in detail, this is undoubtedly a bold and fascinating proposal.